I’ve started working on a GPU procedural content editor and renderer. A core component of this is a collection of GPU noise functions ( eg, Perlin, Cellular, Lattice etc… ). 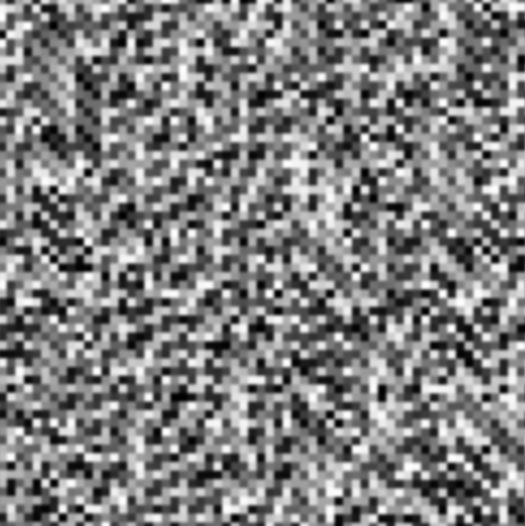 I’ve taken interest in texture-free noise implementations which use hash functions to generate the pseudo random signal rather than texture-based permutation tables. There are advantages and disadvantages for this approach. In short some are…. Hash functions are slower than texture based implementations on typical hardware but can run faster for massively parallel execution. The standard implementation of mod(a,b) would be something like this…. Some compilers do this automatically for you during optimization. Others do not. So it should be done as a matter of course. Implementing mod explicitly like this also allows us to make additional optimizations depending on the context in which it is used. A faster low quality version ( suffers from precision problems ) can be implemented as follows. It can be used when exact mod functionality is not necessary. ( from wikipedia ) Blum Blum Shub (BBS) is a pseudorandom number generator proposed in 1986 by Lenore Blum, Manuel Blum and Michael Shub. It takes the form x_n_plus_1 = mod( x_n^2, M ) , where M=pq is the product of two large primes p and q.
Marc points out that the product of two sufficiently large primes generates a number too large for some GPU’s to handle and so settles on the prime number 61 stating that acceptable results were obtained. This allows for implementations on 16bit or 24bit hardware. The function is used the same way as a permutation table of size 61. Here is some GLSL code which implements the BBS hash function to calculate pseudo random 0.0->1.0 hash values for the 4 corners of a 2D integer grid cell. We make use of the low quality mod for the BBS_permute function. This is because we’re not after exact behavior, but rather in just getting “some randomness” from it. The low quality mod is good enough for this. One observation is the BBS permutation has the nice ( but non-essential ) property in that the sequence will wrap around 61 and repeat itself. Ie, BBS_permute( x ) == BBS_permute( 61 + x ). It is non-essential because we clamp the 4 input coordinates (x,y,x+1,y+1) to the 0->60 range before beginning permutation. Another observation is that it mirrors itself in the middle. Ie, BBS_permute( x ) == BBS_permute( 61 – x ). This is very undesirable as it creates visible artifacts in the noise, as can be seen in this example image. It is possible that we could limit the sampling space to 0->30 to eliminate the mirroring artifact. ( ie, BBS_coord_prepare would perform a mod31 instead of mod61 ). But this would halve the already small domain from 60 to 30, and it can also be seen that the BBS hash still produces some very visible artifacts in the form of long repeating lines and patterns. Luckily both of these problems can be reduced by performing an additional permutation along the X axis. This additional permutation hides the mirroring and produces a final noise with much less visible artifacts. NOTE: Marc makes note in the MNoise reference code that to eliminate the slow ramp up of values close to the origin the first permutation should multiply the input coordinate by a small prime number ( eg 3 or 7 ). I have not done this in either LQ or HQ versions because given other artifacts I have not felt it necessary. But I’ve left it in as a comment for preference. 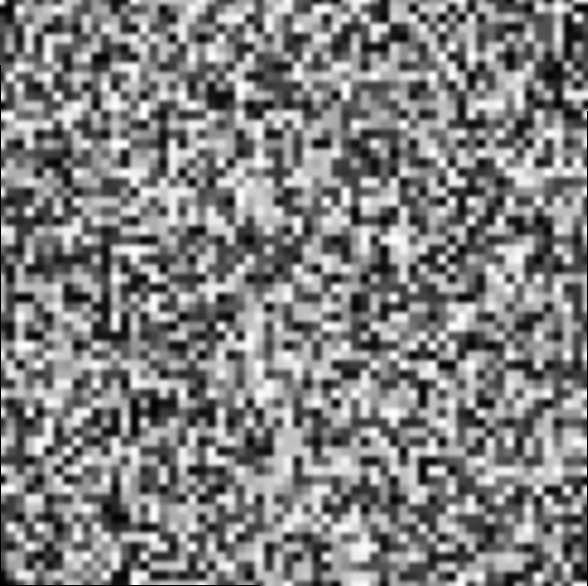 Stefan Gustavson and Ian McEwan have been doing some fantastic work with optimized texture-free noise. They have supplied textured and texture-free versions of Classic Perlin, Simplex Perlin and Cellular noise. Their work can be found here https://github.com/ashima/webgl-noise/ and here http://webstaff.itn.liu.se/~stegu/GLSL-cellular/. For the texture-free versions they use a quadratic permutation polynomial for the core hashing functionality. A permutation polynomial is a function which can permute ( or shuffle ) a set of numbers over a specific range into a different order. So applying the permutation polynomial to any index over the specified range will generate a new index within the same range. Applying this to each index will generate a new ordering for the elements in the set. Permutation polynomials should provide a one-to-one mapping which is free from any clashing. Stefan and Ian have chosen to use a quadratic permutation polynomial of the form F(x) = (34x^2 + x) mod 289. This means it can operate over the integers of 0->288, acting just like a permutation table. 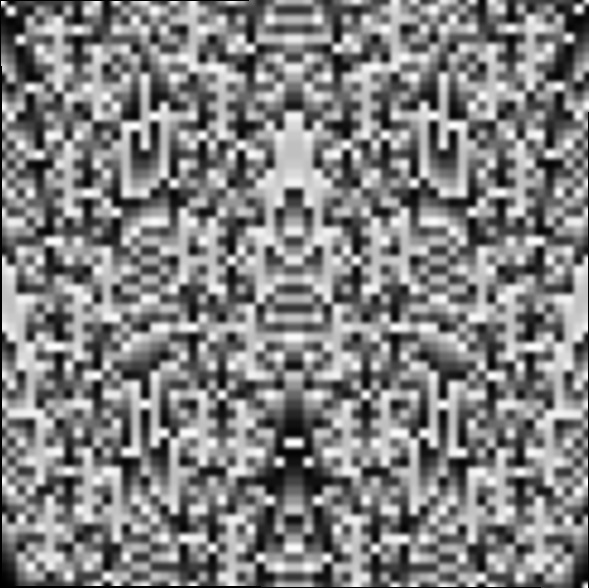 The shuffling is how the randomness is generated. They obtain a 0.0->1.0 floating point number from the resulting integer like so, resolve(x) = fract( x * (1.0 / 41.0) ). The (1.0/41.0) fraction results in a set of numbers quantized to 41 different values. I have opted to use (7.0/288.0) instead because it produces a more varied result at no extra cost. Here is some GLSL code which implements the SGPP hash function to calculate pseudo random 0.0->1.0 hash values for the 4 corners of a 2D integer grid cell. Just like the BBS permute function, the permutation polynomial will wrap around and repeat itself. Ie, SGPP_permute( x ) == SGPP_permute( 289 + x ). And again, it is non-essential because we clamp the 4 input coordinates (x,y,x+1,y+1) to the 0->288 range before beginning permutation. Also like the BBS permute function we make use of the low quality mod for SGPP_permute. This is because we’re not after exact permutation polynomial behavior, but rather in just getting “some randomness” from it. The low quality mod is good enough for this. I am targeting DirectX9 level hardware so have opted for floating point hashing functions. Modern cards can also perform integer hashing which in some cases produce superior results but will often still run slower than floating point operations.